Context: Attention deficit hyperactivity disorder (ADHD) is a complex, multifactorial disorder which is characterized by the symptoms of inattention and/or impulsivity and hyperactivity. In children with ADHD, cognitive and executive functions may be impaired leading to significant behavioral problems that may affect oral health. There is an extreme paucity of the studies related to oral health and dental anxiety among children with ADHD. Aim: The aim of this study is to assess and compare oral health status and parental perception of dental anxiety among ADHD and non-ADHD children. Materials and Methods: A cross-sectional comparative study was conducted among 100 ADHD and 100 non-ADHD children aged 6–17 years in Bengaluru city. A structured validated pro forma was used to collect demographic details, Decayed, Missing, and Filled Teeth (DMFT)/dmft, and gingival index (GI). The Dental Subscale of Children's Fear Survey Schedule was used to assess parental perception of dental anxiety. Data were analyzed using Chi-square test, Mann–Whitney U-test, and Pearson's correlation test (P < 0.05). Results: DMFT was significantly higher in ADHD (1.60 ± 1.6) than in non-ADHD group (1.15 ± 1.32) (P = 0.04). There was no significant difference between the groups for GI (P = 0.3). ADHD children exhibited significantly higher dental anxiety when compared to non-ADHD children (P < 0.001). Dental anxiety was significantly related to the caries experience among ADHD group (P < 0.001). Conclusion: Children with ADHD exhibited a poorer oral health status and higher dental anxiety than non-ADHD children. Hence, there is a need for diligent preventive dental care. Neurodevelopmental disorder affects approximately 10% of the general child population. Various cognitive functions in these children may be impaired, leading to significant behavioral problems that affect everyday life. One common developmental disorder is attention deficit hyperactivity disorder (ADHD). ADHD is a heterogeneous disorder manifested by difficulties of attention and/or impulsivity/hyperactivity. The prevalence of ADHD has been reported to be approximately 3%–6%. Males are diagnosed with the disorder three to six times more often than females. Commonly associated problems (comorbidities) include developmental language disorders, anxiety, oppositional defiant behaviors, fine motor and coordination difficulties, and specific learning disabilities. Virtually, all children with ADHD have deficits in short-term auditory memory, meaning that they find it very difficult to retain more than one or two brief instructions in their mind. ADHD can be highly disruptive to families and can result in academic under-achievement and social isolation. Children with ADHD are more likely to exhibit significant anxiety associated with dental treatment. Berggren suggested a vicious cycle, where dental anxiety leads to avoidance of dental care with deterioration of dental status as a consequence, which in turn leads to feelings of shame and inferiority that increase the dental anxiety. ADHD affects an individual's ability or motivation to maintain appropriate oral hygiene, and this is associated with a higher caries experience. It presents significant challenges not only for the child but also those living and working around that child such as parents, teachers, and indeed dental practitioner. The literature remains inconclusive with respect to oral health in ADHD children. While some studies have demonstrated higher decay missing filling surface (DMFS) scores among those with ADHD, others have found no differences. It is unclear whether ADHD per se or the factors associated with ADHD (such as medication, poor diet, and poor oral hygiene) are risk factors for dental caries. Studies have shown association between dental anxiety and less favorable self-care behavior, avoidance of dental care, and also with poorer health outcomes. Nevertheless, some studies have shown that there was no correlation between dental anxiety and caries. Some studies have observed higher gingival scores among ADHD while few studies found no difference. Studies have assessed oral health status of children with ADHD while few studies have evaluated the relationship between oral health and dental anxiety. Hence, the present study was conducted with the aim to determine oral health status and parental perception of dental anxiety of ADHD and non-ADHD children in Bengaluru city. A cross-sectional comparative study was conducted among 6–17-year-old ADHD and non-ADHD children in Bengaluru city for a period of 4 months from June 2015 to September 2015. Ethical clearance was obtained from the Institutional Ethical Committee before commencing the study. Permission from the head of the institutions and informed consent from the parents/local guardians was obtained. A pilot study was conducted among twenty ADHD children, to check the feasibility of the study and to estimate the sample size. The sample size was fixed as 100 each for ADHD and non-ADHD group. Children who were diagnosed as ADHD based on the medical records were included in the study. Those who were suffering from other local/systemic diseases known to influence dental caries or the severity of gingival and periodontal diseases were excluded from the study. Age- and gender-matched children attending schools and colleges from similar geographic area formed comparative group of non-ADHD children. Prevalidated Dental Subscale of Children's Fear Survey Schedule (CFSS-DS) questionnaire was subjected to cross-cultural validation by means of back-translation method. The translation was done by bilingual translators. Further, it was assessed for readability and comprehension during pilot study. The principal investigator was trained and calibrated before the start of the study. A group of ten participants with a wide range of oral diseases was examined by the investigator using the WHO criteria for Decayed, Missing, and Filled Teeth (DMFT)/dmft and gingival index (GI) by Loe and Silness. These participants were recalled on different days, and the same investigator repeated examination. The consistency of diagnostic criteria was checked by examining the participants and determining intra-examiner variability. The kappa coefficient value (κ) for intra-examiner reliability for the investigator was 0.86. The study was conducted using a structured pro forma that included general information regarding the demographic profile, oral hygiene practices, and medical and dental history. Socioeconomic status was assessed using the modified Kuppuswamy's scale. CFSS-DS was used to assess parental perception of dental anxiety of their children. Oral health status was assessed by recording DMFT/dmft (WHO criteria) index and GI (Loe H and Silness J 1963). The data were collected in their respective schools through interview and oral examination. Self-administered questionnaires were distributed to the parents/caregivers in their respective schools after giving them necessary instructions. The clinical oral examination was carried out by a single calibrated investigator and recorded by a trained assistant. Both ADHD and non-ADHD children were examined at their schools during leisure time, seated on a comfortable chair, under the artificial light. A sufficient number of autoclaved instruments were taken for the day-to-day examination. Infection control measures were observed throughout the study. The data collected were entered into Microsoft Excel spreadsheet and analyzed using the Statistical Package for the Social Sciences (SPSS) version 22.0 (IBM Corporation, Texas, USA). Descriptive statistics were computed. Statistical significance was considered at 5% (P < 0.05) (confidence interval of 95%). Chi-square test, Mann–Whitney U-test, and Pearson's correlation test were used. The proportions of males were more in ADHD group when compared to females. The youngest age group with ADHD is 9–11. According to the modified Kuppuswamy's scale, majority of ADHD and non-ADHD children belonged to the middle class [Table 1]. Average age of diagnosis for ADHD was 8.8 ± 2.5, and the mean age of diagnosis between males (8.7 ± 2.7) and females (8.9 ± 2.2) was not significant. Relatively less number of ADHD children (23%) visited dentist when compared to non-ADHD children (38%). Majority of the children who visited dentist underwent restorations in both ADHD (82.60%) and non-ADHD group (73.68%). Majority of the children in ADHD group used toothpaste (100) and toothbrush (100) and cleaned the teeth in horizontal direction (56) once a day before meals (93) whereas majority of the children in non-ADHD group used toothpaste (100) and toothbrush (100) and cleaned the teeth in horizontal (39) or circular (40) direction once a day before meals (59). Mean caries experience (DMFT/dmft) was higher among ADHD children than non-ADHD children; however, significant differences were observed for the components mt, ft, DT, DMFT only [Table 2]. Among ADHD children, 80% had mild and 20% had moderate gingivitis, whereas in non-ADHD children, 73% had mild and 27% had moderate gingivitis. No significant difference in mean GI scores was found between the groups [Table 3]. Mean dental anxiety score was significantly higher in ADHD children compared to non-ADHD children for the questions related to dentist, touch, look, drilling, instrumentation, hospital visits, white uniforms, and nurse cleaning the mouth. 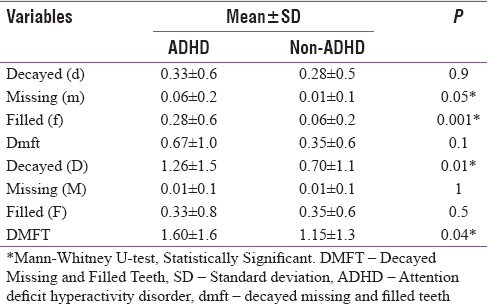 Overall mean dental anxiety score (CFSS-DS) was significantly higher in ADHD children when compared to non-ADHD children [Table 4]. There was no significant association between dental anxiety and gender [Table 5] and dental anxiety and visits [Table 6]. There was a significant intergroup difference for DMFT and dmft among children with dental anxiety. There was a significant intragroup difference for DMFT among children with dental anxiety in non-ADHD group. However, no significant intra- or intergroup difference was observed for mean GI scores among children with anxiety present or absent [Table 7]. There was a weak negative correlation between dmft and dental visits as a number of dental visits can reduce dental anxiety. Moreover, there was a positive correlation with DMFT and GI in ADHD group. Dental anxiety weakly correlated negatively with GI and dental visits and positively with DMFT and dmft in non-ADHD group. 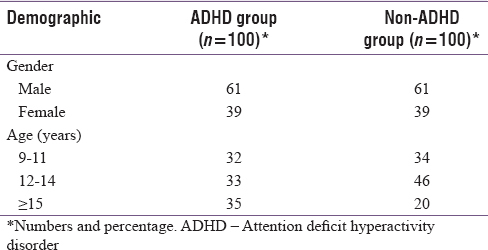 However, significant relation was observed between dental anxiety and DMFT in ADHD group only [Table 8]. ADHD is a complex, multifactorial disorder, frequently associated with significant potential for comorbidity and functional impairment such as conduct disorder, oppositional defiant disorder, anxiety, and learning disorders. ADHD affects an individual's ability or motivation to maintain appropriate oral hygiene. The children have behavioral management problems in dental settings that are connected with fear and anxiety. This cross-sectional study assessed oral health status and parental perception of dental anxiety among 6–17-year-old ADHD and non-ADHD children in Bengaluru city. ADHD is often undiagnosed, ignored, or misdiagnosed in females because their symptoms are less overt, with the hyperactivity facet of the disorder manifesting as talkativeness or emotional reactivity. Although onset is usually around age of three, the diagnosis is not made until the child is in elementary school. Females are also more likely to internalize the symptoms, further complicating diagnosis. In this study, majority of the study participants were males (61) when compared to the females (39) in the ADHD group and similar observations were made in other studies,,,,,, reflecting the higher prevalence of ADHD in males except for one study. The youngest available age group with ADHD is 9–11 years which is almost similar to the other studies (6–9 years and 11 years). Average age of diagnosis is over 8 years, and this indicates time lag between onset and time of diagnosis which might influence oral health behavior. The socioeconomic status was assessed according to the modified Kuppuswamy's socioeconomic scale. This scale takes account of education, occupation, and income of the family to classify study groups into high, middle, and low socioeconomic status. In the present study, majority of ADHD and non-ADHD children belonged to the middle class. Disruptive behavior, dyskinesia (tics), or hyperactivity following medications prescribed for ADHD can pose difficulties during a dental appointment. There is often parent–child conflicts, and they might have contributed for relatively less number of ADHD children (23) visiting dentist when compared to non-ADHD children (38) in spite of their poor oral health. In this study, oral hygiene practices were similar in both the groups although frequency and time of brushing (twice) were better in non-ADHD children than ADHD children which are in line with studies reported in literature.,, Another study reported similar toothbrushing frequency in the ADHD and non-ADHD group. No significant difference in the mean GI score between the ADHD group and non-ADHD group was observed as reported in previous study. On the contrary, one study showed a significant higher level of gingivitis in ADHD group compared to non-ADHD group. ADHD children reported to have a lower capacity for effortful control and emotion regulation and lower cognitive skills to cope with pain, discomfort, and anxiety. They have particular difficulties with anger and impulsivity because of emotional dysregulation that is maladaptive attempt to regulate high emotional arousal. In stressful situations, this contributes to high emotional intensity and low self-efficacy in children's ability to regulate their emotions, and this might be the main underlying factor for higher dental anxiety in ADHD children. One study that used CFSS-DS scale reported higher anxiety similar to the present study where mean dental anxiety score (CFSS-DS) was significantly higher in ADHD children as compared to non-ADHD children, whereas studies using CFSS-DS scale and Corah's Dental Anxiety Scale could not capture difference in anxiety levels between the study groups. A cross-sectional study design and inherent biases in the questionnaire limit the generalizability of this study. ADHD children not attending special schools and subtypes of ADHD were beyond the scope of the study. Children's dental anxiety measured through parental perception is debatable. Further research is required to assess oral health status of different subtypes of ADHD children. A longitudinal study design may be used to evaluate impact of dental anxiety on oral health. This study documents a need for early diagnosis of a condition and prompt treatment. This may be achieved by multidisciplinary approach wherein health-care personnel, school teachers, and parents are trained to recognize these conditions in their practice. Special emphasis at curricular level should be placed on management of ADHD children at dental office. Dentist should make ADHD children's dental experience a pleasant one and instill a positive outlook toward future dental procedures. Incorporation of advanced behavior–management techniques, including protective stabilization and sedation, into their dental treatment will facilitate the goals of communication, cooperation, and delivery of quality oral health care in ADHD children. Special oral health-care programs can be organized by dental colleges in the vicinity of the special school on periodic basis. Children with ADHD exhibited a higher caries experience and dental anxiety than non-ADHD children; dental anxiety was not associated with gender and dental visits but correlated with DMFT in ADHD group only. ADHD children may be considered vulnerable to oral conditions and suffer with poor oral health. There is a need for oral health program that is customized to the needs and demands of ADHD children. Hansen BH, Oerbeck B, Skirbekk B, Petrovski BÉ, Kristensen H. Neurodevelopmental disorders: Prevalence and comorbidity in children referred to mental health services. Nord J Psychiatry 2018;72:285-91. Blomqvist M, Holmberg K, Fernell E, Ek U, Dahllöf G. Oral health, dental anxiety, and behavior management problems in children with attention deficit hyperactivity disorder. Eur J Oral Sci 2006;114:385-90. Efron D, Kilpatrick NM. Attention deficit hyperactivity disorder: A review and guide for dental professionals. J Disabil Oral Health 2002;3:7-12. Adyanthaya A, Ismail S. Attention deficit hyperactivity disorder – A review, dental implications and treatment recommendations for dental professionals. IOSR J Dent Med Sci 2016;1:115-22. Carlsson V, Hakeberg M, Blomkvist K, Wide Boman U. Attention deficit hyperactivity disorder and dental anxiety in adults: Relationship with oral health. Eur J Oral Sci 2013;121:258-63. Aminabadi NA, Najafpour E, Erfanparast L, Jamali Z, Pournaghi-Azar F, Tamjid-Shabestari S, et al. Oral health status, dental anxiety, and behavior-management problems in children with oppositional defiant disorder. Eur J Oral Sci 2016;124:45-51. Murray CM, Naysmith KE, Liu GC, Drummond BK. A review of attention-deficit/hyperactivity disorder from the dental perspective. N Z Dent J 2012;108:95-101. Akbay Oba A, Dülgergil CT, Sönmez IS. Prevalence of dental anxiety in 7- to 11-year-old children and its relationship to dental caries. Med Princ Pract 2009;18:453-7. Blomqvist M, Ahadi S, Fernell E, Ek U, Dahllöf G. Dental caries in adolescents with attention deficit hyperactivity disorder: A population-based follow-up study. Eur J Oral Sci 2011;119:381-5. World Health Organisation. Oral Health Surveys Basic Methods. 4th ed. Geneva: World Health Organisation; 1997. Beena JP. Dental subscale of children's fear survey schedule and dental caries prevalence. Eur J Dent 2013;7:181-5. Bairwa M, Rajput M, Sachdeva S. Modified Kuppuswamy's socioeconomic scale: Social researcher should include updated income criteria, 2012. Indian J Community Med 2013;38:185-6. Chandra P, Anandakrishna L, Ray P. Caries experience and oral hygiene status of children suffering from attention deficit hyperactivity disorder. J Clin Pediatr Dent 2009;34:25-9. Blomqvist M, Holmberg K, Fernell E, Ek U, Dahllöf G. Dental caries and oral health behavior in children with attention deficit hyperactivity disorder. Eur J Oral Sci 2007;115:186-91. Bimstein E, Wilson J, Guelmann M, Primosch R. Oral characteristics of children with attention-deficit hyperactivity disorder. Spec Care Dentist 2008;28:107-10. Blomqvist M, Holmberg K, Lindblad F, Fernell E, Ek U, Dahllöf G, et al. Salivary cortisol levels and dental anxiety in children with attention deficit hyperactivity disorder. Eur J Oral Sci 2007;115:1-6. Hidas A, Birman N, Noy AF, Shapira J, Matot I, Steinberg D, et al. Salivary bacteria and oral health status in medicated and non-medicated children and adolescents with attention deficit hyperactivity disorder (ADHD). Clin Oral Investig 2013;17:1863-7.